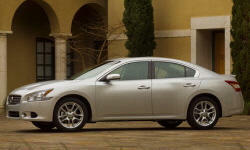 Why the 2010 Nissan Maxima? Lumbar in the base model. Good side bolstering on bottom cushion and through the shoulders. Large range of adjustment and the wheel tilts and shifts. Lots of steering feedback. Very secure on the highway. Tremendous grip in the wet and dry. Feels higher and less direct than a G37 or 335i, but much more involving than a Fusion, Malibu, or Mazda6. Why Not the 2010 Nissan Maxima? Depends on a lot on your right foot. Driven like a Prius, 26 MPG city and 33 MPG highway. Driven normally with occasionally throttle bursts, 27 MPG highway, 21 MPG combined. The CVT ratio spread maxes out at 2200 RPM at 75; a little high for MPG.